When Bob Calves decided to move aboard a boat for full-time living, he had a pretty good idea of what kind of vessel would fit his year &apos;round living needs. An experienced boater for many years, Bob had already lived aboard a sailboat or two, and he knew both the positive and negative aspects of living aboard a boat in general, and a sailboat in particular. This time around, he wanted to avoid the cavelike atmosphere of a sailboat interior. In many boats, sail or power, sitting or standing, there&apos;s just no way to see outside comfortably, and the resulting feeling of isolation is not a characteristic he wanted in his new home. So Bob Calves went looking at trawlers. Browsing the many different new and used trawlers and cruising powerboats on the market, Bob finally settled on the Nordic Tug 32-it fit his space needs, and he loved the tugboat look. It had large windows with a bright interior, and a low maintenance exterior. Great for living aboard. While he originally intended to purchase a new boat, it turned out that a Nordic 32 (Hull #27) became available in the Great Lakes, so he went to look at it. The boat was just what Bob was looking for, so in 1992 Bob negotiated a deal for his new home, Diamond Sea. He has successfully lived aboard ever since, all except for about ten days. We visited Bob aboard Diamond Sea, and got a chance to see how he has managed to do it all-that is, maintain a proper cruising vessel while having the comforts of home. 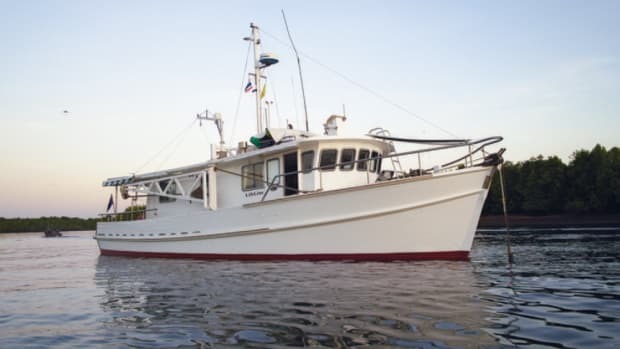 Diamond Sea has evolved over the years to become a unique Nordic Tug, and the perfect liveaboard for Bob. Yet it is also a real cruising yacht, as Diamond Sea cruises regularly up and down the U.S. East Coast. In fact, his single Cummins diesel has 2,500 hours on the hour meter. Bob spends most summers in Maine, the cold winter months in Georgia and the Carolinas, and the rest of the time based out of his homeport of Kilmarnock, Virginia. Bob rarely sits at a marina. With water, food and clean clothes capacity for two weeks at a time, Diamond Sea is usually anchored in a quiet cove or moored in an interesting port-yet Bob is still always home. The refinement of Diamond Sea took place over several years, and Bob has done some interesting things to his yacht to make it better. He showed us these modifications, and explained just how well this has worked out for him. Maybe there are some pearls here for the rest of us! One of the things that attracted Bob to Diamond Sea was a solid bulkhead between the galley and the rear of the pilothouse. Most Nordic Tugs don&apos;t have this bulkhead, but rather the space is left open. Since he was intent on maximizing space, Bob saw this bulkhead as a wonderful opportunity to add functionality to the galley area, as well as allowing for installation of a proper entertainment center. The next time Bob took his boat up to Maine, he contracted with Hinckley Yachts, in Southwest Harbor, to do the interior cabinetry work. They built a long shelf across the bulkhead, taking full advantage of the available space. A microwave oven was installed over the galley sink, a television and stereo were installed over the Norcold refrigerator, and shelf space was incorporated into the cabinetry for books and extra provisions. They did a great job, as the modifications blend perfectly with the rest of the boat. occasional use, Bob knew from previous experience that settees aren&apos;t the most comfortable for extended or full time living, and an adjustable table isn&apos;t sturdy enough for secure use at sea. After living with this arrangement for awhile, Bob decided to make some more changes to his home. a complete desk and office work area, with additional storage for a computer and office supplies. He also wanted enough living space for two chairs. Remarkably, the actual work only took a week to complete, and the result is very interesting indeed. Only one settee remains (it has an extension for use as an occasional berth)-the other settee was sacrificed. A large fixed table surface blends into cabinetry along the port side of the hull, and the top surface laminates were colormatched to the rest of the interior. Bob then purchased two chairs from an office supply store (they were broken down so he could get them through the door). He trimmed the back legs of one chair to make it more of an easy chair for reading or watching television. He also added Vetus halogen lamps for reading and better lighting in the cabin. Overall, the interior space feels much larger than a production Nordic 32 saloon, and the functionality is definitely increased. The table and cabinets are surprisingly sturdy, especially since they weren&apos;t built in heavy massive teak as is sometimes found in trawlers. A nice change. One thing Bob did when he moved aboard Diamond Sea was replace the pleasure boat-sized toilet bowl with a Groco Model K1 household-size bowl. Some aspects of boat living can seem more like camping than being at home, and Bob wanted nothing to do with the camping experience. Again while at Hinckley&apos;s yard in Maine, Bob had them build a 60-gallon holding tank made from 1/4" aluminum. The head is plumbed directly into this holding tank-there are no Y-valves to clog. The tank itself has provision for deck pumpout, and there is an overboard discharge hose that passes through a macerator pump. There is no vented loop to create an odor, because the discharge hose from the macerator pump loops up and then down to a nearby seacock, which is normally kept closed-except when pumping out-so there is no chance to siphon water into the boat. The macerator pump can only operate by flipping two separate switches so it is impossible to accidentally turn it on. The system is very simple and basic-and it has worked out well. Bob uses fresh water to flush the head, eliminating one of the biggest causes of odors, seawater. And the toilet mechanism lasts longer between rebuilds. perfect for two people for two weeks with reserve. One of the problems with living aboard is dealing with moisture and mildew, especially when an onboard shower is used. Again, Bob came up with some novel things to deal with it. To begin with, he uses shock cord to keep the head door normally open. This ventilates the entire head compartment, and also reduces door rattles while under way. The shock cord doesn&apos;t interfere much with going into the forward cabin, and it is easy to get accustomed to the normally open door. attached a teak batten over one side edge of the plastic shower curtain, screwing the wood strip firmly to the right side of the shower stall. He then visited an RV supply store and purchased a length of curved curtain track, which he mounted on the shower stall ceiling. The shower curtain is attached to this curved track, and when the curtain is pulled closed, it overlaps the shower stall opening by at least six inches, curving into the stall. The bottom of the curtain is cut to just clear the floor, and has drapery weights to keep it taut. This system effectively seals the shower stall, and Bob reports it works perfectly. In fact the only moisture problem on Diamond Sea is when a hot shower is taken in cold weather. With the head door open, the steam rolls out, up into the pilothouse- causing condensation on the windows that happen to be directly overhead. Nothing&apos;s perfect! The Nordic 32 uses a fabric material as a lining along the hull of the forward stateroom, which acts as insulation while living aboard. The relatively tight space in this compartment has kept Bob from doing many modifications in terms of layout or cabinetry, but he has found it a livable cabin for sleeping. He did replace the standard foam bedding cushion with a real mattress that uses full size sheets and pillows. This may be a little thing to many people, but living on a boat with odd-sized sheets, blankets, and pillows is a real nuisance. Having the convenience of genuine bedding adds a touch of home. Bob had the dummy stack removed from Diamond Sea, and Hinckley replaced it with a short mast that began life as a Bermuda 40 mizzen mast. This mast is the mount for radar and various antennas. Bob installed a Kahlenberg steam whistle for that tug sound, which is driven from a 12 VDC compressor located in the lazarette. He also added a commercial grade Perko searchlight to help locate navaids while cruising. This boat sure looks like a tug! On the roof of the pilothouse, Bob installed a Coleman 110 VAC air conditioner, which cools the boat when Diamond Sea is plugged in at the dock. The unit is rated at 16,000 BTU, and does a great job during the humid summer nights. Being a unit for an RV, it is also much cheaper to purchase than a marine model, and is easily replaced by removing four bolts. It is mounted at the high point of the boat, and Bob installed two air handlers in the pilothouse to help distribute the cool air throughout the boat. for a 32-footer, but there is a lot of glass area on the Nordic 32. There is also an engine-heated Red Dot heater installed at the foot of the galley. Overall Bob can stay nice and warm during the winter, and cool in the summer-especially since he travels and follows the seasons. The water system aboard Diamond Sea was changed to drastically increase water capacity, as well as simplify plumbing. Replacing the plastic water tanks that came with the boat, Bob installed stainless steel water tanks that upped his capacity from 100 gallons to 170 gallons. Because of the tight space around the water tanks (located under the saloon floor), he plumbed the tanks with a single T-fitting with a 1.5-inch fill on one end, which is then reduced to 3/4-inch for the water system supply line along with a sight gauge. Simple and fool-proof. He also replaced the standard hot water heater with the excellent stainless steel model manufactured by Atlantic Marine. In terms of electrical power, Diamond Sea is set up as a 12 VDC boat, with most electrical needs satisfied from that power source. 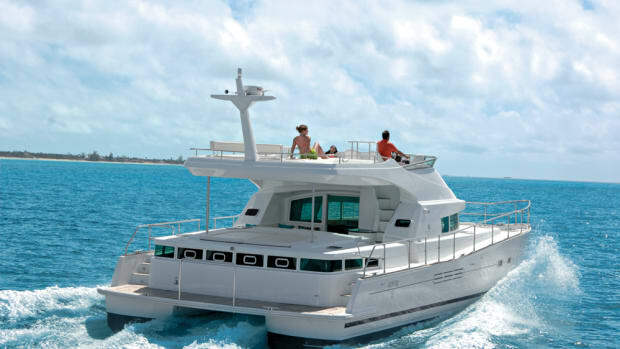 There are two inverters on the boat; one 250 watt unit for computer/ office use, and an 800 watt inverter for the microwave, television, and other household appliances. simple solutions are sometimes the best solutions. Beauty is in the eye of the beholder. First and foremost, she must be a pretty boat in the owner&apos;s eyes. She must be seaworthy. A long, full keel and a low ratio of side area above the water as compared to the area below the water. She must have a single engine with a fully-protected propeller and rudder. Simple systems that are rugged. Fresh water should be used to flush the head as this makes for a much cleaner and pleasant head compartment. The shower must be a separate stall with a truly waterproof curtain or door, and a non-clogging sump pump. Settee-berths do not make long term comfortable seats. Proper chairs or a sofa are important. There should be a quiet diesel-fired heating system to keep the boat dry and everyone warm and cozy. Finally, and most important- many operating and maintenance costs are in direct proportion to length. Unless one has unlimited funds, it&apos;s best in the long run to buy quality, not size. It is always interesting to visit someone who has found a balance of a good cruising boat that is also a true home afloat. 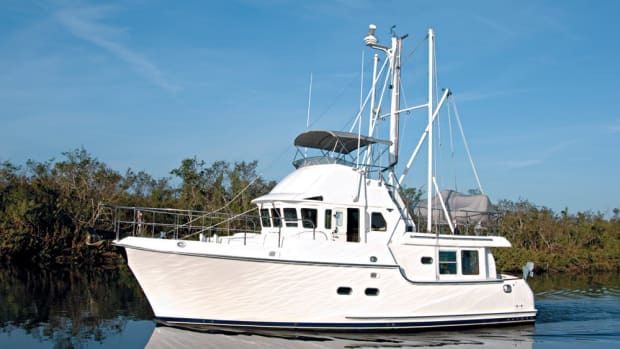 While Diamond Sea may not be everyone&apos;s answer to the ideal liveaboard passagemaker, it has proven to be the right boat for Bob Calves. Nordic Tugs builds a good boat, witnessed by the many tug yachts around the country. And for at least one man, the Nordic Tug is also a real honest-to-goodness home. As more and more people explore this avenue of boat living, perhaps many will also realize the quality of life the right boat can provide. Living on a trawler or tug doesn&apos;t have to be uncomfortable, and the boat doesn&apos;t even have to be huge. Life afloat can be fun and rewarding. And give away your tent and sleeping bags- people interested in camping need not apply!